Glenn Cowan was the off-beat, independent-minded American table tennis champion who sparked the 1971 Cold War-ending “Ping Pong Diplomacy, leading to the normalization of Sino-American relations. 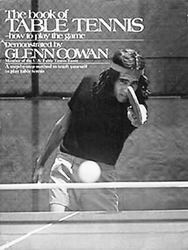 A Los Angeles 15-year old transplanted New Yorker, Cowan won the Hollywood Table Tennis Open in 1966––the youngest player ever to win the event. In 1967, he was the U.S. Men’s 17-under champion; ranked Juniors #1 and Boys #2. By 1968, the 17-year old was a member of the U.S. National Men’s Team and, at the same time, the Junior Mixed Team. Cowan was #6 in U.S. Men’s rankings in 1969. In 1970, he captured the U.S. Singles title. The years 1970 and 1971 brought Cowan to the apex of his table tennis career, named to the U.S. World Cup (Swathling) Teams. It was during the ‘71 World Cup in Nagoya, Japan that he hitched a ride after practice on the Chinese team’s bus. Long-haired and flamboyant-looking attired in a floppy hat, he caught the fancy of 3-time Chinese World Champion Chuang Tse-tung, who presented him with a traditional athlete-to-athlete friendship gift. Having nothing in his sports bag to give in return, Cowan promised he’d have something for Chuang later on. Before their next competition, the Southern Californian stopped at a small tourist shop and picked up a red, white and blue shirt featuring a peace emblem and the words, “Let It Be”. When presenting it later to Chuang, it caused a Chinese team and media sensation, prompting the Chinese to invite the U.S. team to mainland China over Easter. Back in the U.S. Glenn was quoted: “I think I could mediate between Chou En-lai and President Nixon.” In the next few breaths, Glenn wrote a table tennis book and returned to his game, and “Pin Pong Diplomacy” ignited Chinese-American political dialogue. Glenn Cowan died in 2004 following heart by-pass surgery.